Ambient Visions is proud to continue our series of Artist interviews with our latest entry featuring Patrick O'Hearn. Since the release of his critically acclaimed Ancient Dreams CD Patrick has been no stranger to ambient listeners over the years. Towards the end of 2000 Patrick returned to the world wide web with a brand new website and announcing that he had a new CD ready for release. Patrick's music has often found its way into our CD players here at Ambient Visions so we thought now would be a good time to catch up with Patrick and to see what he had been up over the last few years. Anyone who has read one of Ambient Visions' interviews knows that we don't stop there either. Join us as we talk to Patrick about the roots of music in his life, his early days in the world of pop music and his triumphant entry into the fledgling ambient music industry. I'm sure that you will find it as fascinating as I did. Join us now as we present Patrick O'Hearn. AV: When was it that music became a major influence in your life and how did you go about pursuing that interest back then? PO: I was born into an artistic family, both parents being musicians, aunts, uncles and grandparents whom were actors, artists and musicians. Music was always being played in the home, both live and recorded, every get-together or holiday was an open invitation for a jam session. So, music was from my earliest childhood memories a major influence. I was encouraged to grab any instrument I could produce a favorable sound upon and join in. If I expressed interest in an instrument that we did not already have around the house or that was unavailable through the public school band department, my parents would make an effort to aquire it for me. AV: What were some of your earliest influences by other artists of the time period? PO: My Mother's taste in music, although a good jazz pianist herself, was classical music. My father on the other hand, leaned toward jazz and R&B, so between them, I found influence and enjoyment from the records they were playing by the likes of Copeland, Ravel, Stravinsky,Debussy,Bartok, Satie, Barber and others, to, Miles Davis, John Coltrane, Charlie Parker, Coleman Hawkins, Ben Webster, Duke Ellington, "Big" Joe Turner and others. AV: Tell me about your first taste of success as a performing artist? PO: My first taste of success was in playing bass in my Mother's nightclub combo. I had a good ear, had learned alot of "standards" and was beginning to be hired by other groups in town as a sub. I soon gave up my paper route, forgot about former summer jobs such as picking fruit and vegetables, joined the musicians union and was on top of the world at age 15. AV: Tell me about your time spent as a jazz player. In what ways did it contribute to the music that you now create? PO: I came up in learning music through the jazz school. Listen carefully to everything else that is going on musically around you in an ensemble setting, go with the flow, or take the lead and re-direct it, total interplay. A good jazz musician knows what notes will enhance the other musicians, a great jazz musician knows what notes the other musicians or soloist they're accompanying may play before they're actually played! intuitive ESP. My jazz backround has not contributed much of a part in most of my solo work. Although I believe that is slowly changing. Jazz is about being on the edge musically, and by that I mean feeling completely comfortable in walking the highwire without a net. Nothing to hide behind. You step out and bare all. 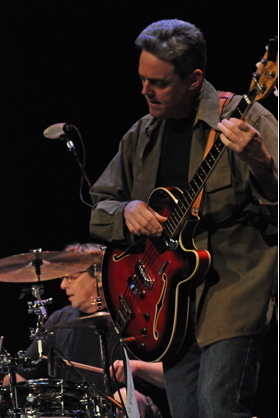 Most of my solo work has focused more on writing and arranging rather than the improvisation of jazz. AV: Some folks may or may not be aware of it but you were a member of the 80's group Missing Persons. Did you consider this to be somewhat of a pinnacle in your career thus far and were you happy with what you were doing? PO: Missing Persons was fun, for the most part, while it lasted, but I didn't consider it a pinnacle. I don't think any of the band, save for front-woman Dale, would have. It was more an opportunity to play music and travel the world with good friends and musicians. Prior to Missing Persons I had been recording and performing with jazz musicians Tony Williams, Charles Lloyd, Joe Henderson, Dexter Gordon and had spent two and a half years as bassist in Frank Zappa's band as well as co-founded Group 87 along with Mark Isham and Peter Maunu in which we had recorded for CBS records. Although Missing Persons was an excellent band, these other efforts I would have to considered more a pinnacle, at least from an artistic standpoint. AV: I'm curious as to what it was like playing with Frank Zappa's band. What kinds of experiences do you take away from a unique band such as Franks? PO: I was a member of Frank's Group for 2 1/2 years, and in that time learned a great deal. Although a taskmaster who knew what he wanted, Frank was a most open minded man as well. He was perhaps the last of a breed of composer, and I would cite Duke Ellington as an example as well, who used a large ensemble of fine musicians as an instrument. This of course is done today with midi, but if one has the luxury of having live musicians on hand to interact with and direct, the developing results are far more intriguing, not to mention faster, than that from a computer. Frank was an iconoclast, no doubt about it, and the rich experiences I gained from that period I'm greatful for. I miss him and his wonderful sense of humor. AV: How does someone go from doing 80's pop to ambient music? What were some of the reactions that you got from fellow artists and fans of your pop work to your new musical direction? PO: The music I was playing in Missing Persons had a very direct effect on the music I begin to compose on the side and which would be the beginning of my solo career. In 1984 the band was straining from internal tension, primarily the crumbling relationship of then wife and husband team, Dale and drummer Terry Bozzio. Rehearsals, which were nightly, became very stressful and I would return home afterward to my apartment where I had a small project studio, and would begin improvising and recording musical ideas that were deliberatley far afield from what I had been doing earlier with the band. Reaction to this material from other musicians was very favorable, although some fans may have been taken aback at first by this very different sound from what they generally associated me with. AV: What was your first release in this new phase of your career and how was it received by fans and industry alike? PO: Ancient Dreams was my first solo album, recorded in late '84 and released in mid '85. When I recorded it, I wasn't sure anyone would care for it. My musican friends enjoyed it, but would anyone else? The beauty of those days was that I could have cared less. I loved it and that was all that mattered! A healthy artistic perspective that I'm now proud to say I've regained. As it turned out, it was very well received by fans and industry alike. The times were ripe for new innovation in radio format as well, and Ancient Dreams got alot of airplay considering it's different sound and all instrumental tracks. The album also benefited sales-wise from it's exclusive Compact Disc release, as not alot of music was then available in that new medium. AV: There are quite a number of names floating around for the types of music that you do, what do you call your music and how do you personally define the genre of music that you make? PO: Categorizing of my music has been a major problem since the late 1970's Group 87 days I mentioned earlier. If you're a versatile musician/composer, comfortable in many cross genres and whom draws influence from a broad pallet, you've got trouble when it comes to classification. "Contemporary Instrumental"?.....what happens when you add voice? "New Age"?....that brings a whole metaphysical philosophy into play. "Ambient"?....perhaps the closest and indeed an area of music near to my heart. I personally gave up trying to type it years ago. I'm currently listing the files I upload to mp3.com as "mood" music. Sounds funny and a bit retro, but it just may be ambiguous enough to fit the bill. AV: Could you give me the names of the ambient artists that have most influenced the work that you do and why they are important to your music? 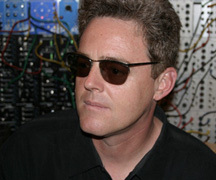 PO: I can give you a list of ambient/experimental musicians whom I have very much enjoyed listening to over the years. However, I would not venture to say to what extent they may or may not have directly influenced my own work. These fine fellows would be, Brian Eno, Jon Hassell, Daniel Lanois, Mark Isham, David Torn, Peter Maunu, Steve Roach, Robert Rich, Vidna Obmana, Jeff Pearce and Michael Stearns. Then there is all the interesting electronic music that has come out of England in the past 6 years, not to mention the wealth of experimental music which flourished in Germany in the 70's & early 80's. But for me, the afore mentioned chaps continue to knock me out with their creative work. I'm sure I could well extend the list of names given enough thought. But again, it's not that these people have so much influenced my work, but that they continue to feed the pool of available recorded music that we can all enjoy. AV: With each new CD does it get easier or harder to create the next one? AV: How does the creative process work for you as you go from initial idea of a new project to finished CD? PO: The process itself is usually simple and sometimes swift. I will get an idea or theme, grab hold of it and within 2 months the final selection of material will be evident and the album complete. However, this is not always the case and some albums will take longer, sometimes alot longer to formulate and take on shape. It can even become frustrating at times especially if the subjective sphere of ones mind decides to leap "center stage" into the act. The trick there is to make every effort to help the creative muse of intuition prevail. Otherwise, it's the dreaded "paralysis from analysis", a hamster wheel, or darken alley that most all artists fear and hope to avoid. Sometimes, making electronic oriented music itself can become a laborious process. Taking great care to sculpt sounds just so can require alot of time. But, eventually you know when the project is complete and that it's time to let go and move on. AV: When you reach a road block in the creative flow what do you do to break the block and get back to work? PO: Move on to another composition, or if it's severe, tend to other details that need attention, play with the kids, go for a long walk in the woods or some peaceful place. If it's critical,..cut a load of firewood with a chainsaw, split and stack it..that'll do it for sure! AV: Did you know after your release of Ancient Dreams that you had found your niche and that you would be working in this genre for quite some time to come? PO: No, those thoughts did not occur to me at that time, or even 2 or 3 albums down the line. In fact, by my 4th album, Eldorado (1989) I was ready to try something altogether different and directed my efforts to finding film score work. AV: Does it still stimulate you artistically even after the release 10 CD's to approach the next project? PO: Yes, very much so. I read an article back in 1992, whereby 4 prominent artists of independent fields were interviewed, paint, film, music, literature, the subject of the piece was the so called "7 year cycle". They all agreed that important personal creativity often moves in 7-10 year cycles. I agree as well, so perhaps one is stimulated artistically to different degrees during this period. I feel excited about what I'm currently doing and about future projects in the works, which is good! I would hate to have boredom rear it's ugly head. AV: Tell me about some of the equipment that you use to create these wonderful soundscapes and how long has it taken you to master some of it? PO: Most of my equipment I've owned for some time now. The mainstays of tone creation would be: PPG 2.2 synthesizer, Studio Electronics Minimoog, Analogue Solutions custom modular, Akai S6000 sampler, Lexicon PCM 90,80,70's,42's, Eventide H3000 Harmonizer, Doepfer Shaltwerk and MAQ 16/3 sequencers, API eq's and mic pre's, Neve eq's and mic pre's. Mic's are Neumann, AKG and Shure......the afore mentioned is the core and for the most part simple and intuitive, although the Doepfer's and Lexicon 90 & 80 will allow you to dig as deep as you may wish to go...the time most unfortunatly spent would be that of PC's, computer software, sync and interface....time bandits all,...wish I could do without any of them,...but I can't. AV: Are you thinking of using the DVD format as it exists now or perhaps the in progress DVD audio format to expand your music to the realm of surround sound? AV: I found Mix-Up to be an interesting CD in the overall landscape of what you had done to date. What brought that CD about and what kinds of reactions did you get to its release? PO: Everything from "love it" to "what an utter crock of sh** "... That record circa 1990 was the brain child of the A&R dept. of Private Music. They wanted a new release and I didn't have one. I had just finished 23 episodes of T.V. scoring and was not in a music making frame of mind...or any sane frame of mind for that matter. Re-mixing was becoming en vogue and they thought that they could break into the club scene with such a project. When they posed the idea, the agreement was that the music would be tested in some european dance clubs, If it clicked there, it would be released in the U.S., if it fell flat, it would be abandoned and no one the wiser. Under that agreement I said ok, sure..give it a try. The next thing I know, it's in the local record stores! Direct from pressing plant to retail as a new Patrick O'Hearn album! No testing whatsoever. I was taken aback. I did make some good friends with two of the producers I met that were involved. Joe "the butcher" Nicolo and David Barratt, both very fine and talented chaps. Overall, I enjoyed the outcome, but some of the stuff makes me cringe to this day. Oh well, consider the time period I guess. It's like platform shoes pukka shell necklaces. AV: Here's a loaded question but one I thought our readers might like to know about. What are your feelings on the MP3 controversy? I know that you have some material available for listening on MP3.com but I was curious as to your feelings about the battle between the record labels and those who say that there should be no restriction on information on the web. PO: I support the idea of an mp3.com. That is, if artists wish to make available their own material for streaming or download and are credited or compensated for it if they so desire. I don't however support the Napster model whereby anyone can upload or computer network any copyright protected CD by anyone for massive swapping. I thought that author Stephen King had a clever idea. He wrote a four part novel and as he posted each section online for download from his web site, all he asked is that the person downloading it send him a $1 and that they not make copies to freely distribute to others. It was an honor system experiment and I wonder how it turned out? The goal I guess, is to somehow find a way around the "big business" filter that keeps alot of art from being discovered by the public. The major record labels have all settled their lawsuites with mp3 and napster and some now have vested interest in these maverick's. They can now tame and utilize the beast to push their own product and grab a piece of the pie. It reminds me of early 1950's Las Vegas, albeit a passive version. The internet is very interesting indeed and overall I ere on the side of "no restriction", but lets not make anyone's intellectual property the victim of piracy. AV: What kind of impact would you say that the web in general has had on the ability of small ambient and electronica labels to reach their intended audience? PO: It's been a potencial God send. To promote music both audio and visual to a global audience for the price of hosting a web site is nothing short of amazing. That is, if the audience can be made aware of the site. There's the trick. AV: What kind of future relationship between music and the web do you see a few years down the road? PO: Good question! I have musician friends who are eager for the day when their music is delivered entirely via the web. Perhaps I show my age, but I'm not so sure about that concept, at least for the time being. Anyone who has up or downloaded even small 6meg files with a 56k modem knows how painfully slow that can be. Although networking music live has been around for 10 or more years now, it still remains the extreme exception and not the rule....as wonderful a prospect that it is. However, technology will keep moving forward and perhaps in a few years we'll all have access to very high speed internet connection and that will open many possibilities for the musician, the web and computer world. AV: I know that your new site at patrickohearn.com was is not your first entry onto the web. A few years back you had another site and but at one point it just vanished. What happened with that first attempt to enter the web? PO: That was deepcave.com. It came online not long before our distributor went bankrupt. When that happened the label was put into a holding pattern void. Much time passed before I secured arrangements with another distributor and it soon became apparent that this new arrangement wasn't going to work either. With no new music to be relased under these conditions and no new information to post that would be of interest to the public I decided to take it down rather than leave a static page hanging there which could only serve to frustrate repeat visitors. AV: Was it my imagination or were your CD's hard to find during this same time frame? Was there something happening behind the scenes that caused the music to disappear for awhile? PO: Yes, the going out of business of my distributor and subsequent unsuccessful efforts at finding a suitable replacement meant that my Deep Cave titles were soon no longer available in stores. About the only place you could find them were at online power-house, amazon.com., and this being only possible in as that I deal directly with them. They're the only major online merchant, to my knowledge, that deals directly with artists and small labels. I suppose that had I more focus and enthusiasm at that time, 1997, I would have moved to setting up my own sales and fulfillment directly online from my site, as so many artists are now doing, but, such was not the case. Deep Cave is gone now but I intend to keep those titles "Trust" and "Metaphor" available through my new site. AV: I was reading through the newsgroups a couple of months ago when I first saw that you had returned to the web with patrickohearn.com. Tell me about your new website and how you'd like to use it to promote your work and stay in touch with your fans. PO: I've now returned to web with an artist-centric name and site which will avoid any confusion that an label-centric site might create. 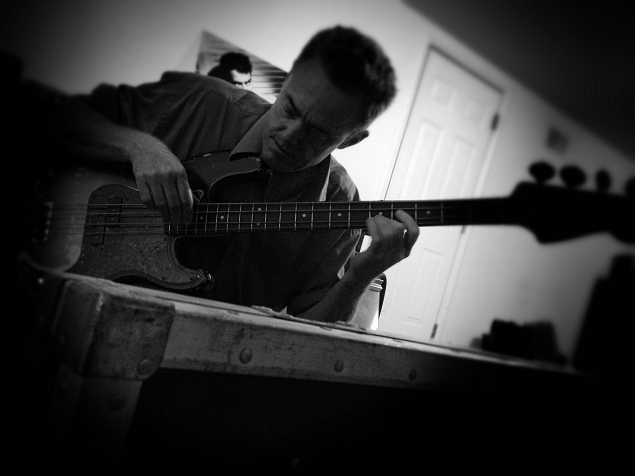 At patrickohearn.com, I can develope a page that gives insights into my music, studio, instruments and method of working rather than a label page that promotes it's releases and branch's off from there to artist info. Having my own name.com will also make it easier for fans of my earlier releases to find me, those that may never have been aware of my deep cave titles, that is, once the search engines finally pick up on me. I think the most challanging thing to my new site will be in continuing it's developement and keeping it fresh with new content. Not an easy task for a man that takes as much time to make records as I do. 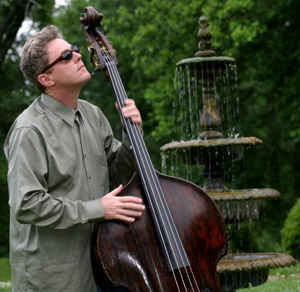 AV: Once at your new site I was gratified to learn that a new CD was soon to be released entitled, So Flows the Current. Where did the title for this release come from and what meaning does it hold for you? PO: The cover for this new album is a photo of my son that I took several years ago at a waterfall near our home. He's much grown now from the time when this picture was taken. I'll sometimes sit beside this stream to relax and often lose myself in though about the concept of time while watching the water pass by. The title to me is a metaphor of growth and the cycles of life. AV: Tell me about what we can expect to hear on this new CD and how it reflects any changes you've gone through over the last few years. PO: This album took along time to make. This is by no means to say that it is some master piece that was years in the making, it simply just took far longer than any previous album I've done to date. It's a nice melding of ideas and mood and I think it shows a maturing over my earlier records. It's not modern en-vogue cutting edge material, anyone expecting that would be disapointed, It's just the particular album that needed to be made at the time it was made. It has more a "live-played" feeling about it, I guess because I ditched the sequencer and all playing was live, and that's a change for me. There's nice performance contributions from guitarist Peter Maunu, cellist Pat Johnston and percussionist Robin Tolleson. Overall, I'm well pleased with it. AV: You also have many film and tv scoring credits on your resume, how does it differ in process to create music for a film or tv show as compared to writing and composing a new Patrick O'Hearn release? PO: Writing for film, when a gig does come my way, is easier for me than writing records. With a film, you are presented with an already defined template, that being the narrative, plot or story line. You read the script or watch the rough cut of the film and the ideas start rolling. It's like a good session player that comes in, listens to the track and knows right away what is needed to take the music to another level. Much different than pulling an album out of thin air and the challenge of keeping it cohesive. The intense deadline pressure of film scoring also works well for me. You have only a few short weeks, or in many cases, days to deliver the goods. There is no time to second guess your instincs as there is in most record making. AV: Looking back over your career to this point in time, what do you think that you have learned about the music business and yourself as a musician? PO: With respect to the music business overall; try not to live too far beyond your means, the realm of art's and entertainment is clearly a world of peaks and valleys. In regard to being a musician; stay true to your own voice and look not to others for praise or criticism. AV: Are there any projects in the works that we should be looking for from Patrick O'Hearn in the short term? Any touring ahead for you in support of the new release? PO: No plans of touring at this point, as much as I would love to play out. I have started work on my next record, which by no means will take 4 years to release, I also have made plans with Peter Maunu to record a duo album this year, and, I hope that this will be the year that Steve Roach and I finish our album that we started back in '97. I am hopeful that I can get this surround sound version of So Flows The Current done soon, although just where to release it remains a mystery, and I look forward to releasing the Simpatico score before too long as well. AV: Any final thoughts that you would like to share with your fans who might be reading this interview? PO: Just one, thanks to any and all that have found interest and enjoyment in the music that I make. AV: And thanks to you Patrick for taking the time to talk to us and for creating such wonderful music that has brought a lot of enjoyment to those who have listened to you over the years. 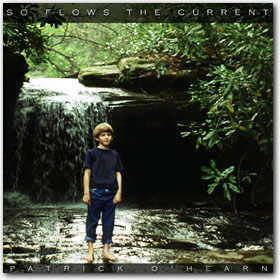 Good luck with your new release, So Flows the Current, I'm sure it will be another classic Patrick O'Hearn release.